Album des Pavillons 2000 shows the new badge. 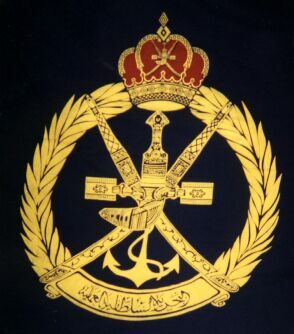 A fouled anchor, on which the Omani national emblem is superposed. The anchor appears only between the lower parts of the two daggers. Between the tips of the dagger, a scroll with Arabic letters. Two wreaths in the continuity of the scroll. The Sultan's crown on top of the emblem, between the upper tips of the wreaths. All elements are yellow except the main part of the crown which is red and bears in the middle the Omani national emblem in yellow. The new Oman Navy jack, is a blue flag, ratio 2:3, with r-g-r [red-green-red?] stripes, gold crown on top of gold anchor.